Singapore-Indonesia has emerged as one of the world’s fastest growing markets with capacity up 40% year-over-year. While capacity increases on the two largest routes connecting the two countries – Singapore to Jakarta and Bali – have captured most of the attention, secondary routes are growing even faster. The third and fourth largest Indonesian destination from Singapore, Surabaya and Medan, will see capacity nearly double in Nov-2013 compared to Nov-2012. To the 10 other smaller Indonesian destinations served from Singapore, capacity is increasing by a collective 78%. LCC group Tigerair has quadrupled its Singapore-Indonesia operation over the last year, growing its share of capacity in the process from about 4% to 15%. Tigerair now serves eight Singapore-Indonesia routes, up from only two a year ago. AirAsia has a 17% share and also now serves eight Singapore-Indonesia routes, up from four a year ago although its capacity has increased a more modest 34% from a much higher base. The Singapore Airlines (SIA) Group is the market leader with a 31% share and will soon serve all 14 routes as regional subsidiary SilkAir has added three Indonesian destinations. This is the second part in a two-part series of reports analysing the rapid growth in the Singapore-Indonesia market. The first part looked specifically at the Singapore-Jakarta market, where in Nov-2013 capacity will be up 24% year-over-year to about 65,000 one-way weekly seats. Singapore-Jakarta accounts for over 50% of all Singapore-Indonesia capacity but its share of the total market is actually slipping as growth on other routes is faster. This is somewhat surprising as the main benefit of the new air services agreement that Singapore and Indonesia forged in early 2013 was to free up new traffic rights on Singapore-Jakarta, which had not grown in recent years as each side was already fully using their allocations. The Singapore-Indonesia bilateral also limits capacity on Singapore to Bali, Surabaya and Medan. But there was still some available capacity on these routes prior to the new agreement. The new agreement raised the cap on all four routes covered under the bilateral by 50%, providing even more space for growth on Bali, Surabaya and Medan and opening up Jakarta – where it was thought most of the interest lay. Airlines indeed have quickly added capacity on Singapore-Jakarta, which is the second largest international route in the world. But the 24% increase in capacity that has thus far been implemented or announced is smaller than the increases seen on Bali, Surabaya and Medan. And on several smaller secondary Singapore-Indonesia routes, which have always enjoyed open skies, there has been an even larger increase. This highlights the strength of the Indonesian market, which is seeing growth not only in Jakarta but throughout the country. Secondary Indonesian cities are benefitting from the rising Indonesian economy and are also seeing increases in their middle class populations. Secondary cities in Indonesia have traditionally been under-served with little or no international services. Congestion in Jakarta, where additional slots are hard to secure, is further driving growth at secondary airports. More or new links to Singapore is logical given the close ties between the two countries and the fact Singapore has emerged as a big draw for Indonesian tourists. There are also huge opportunities for airlines to carry passengers from secondary Indonesian cities via Singapore to destinations throughout Asia-Pacific and beyond. Demand for international travel is growing throughout Indonesia. Connecting in Jakarta is a hassle given the congestion of the Jakarta airport and Jakarta has a relatively limited international network. Singapore Changi and the SIA Group are relying heavily on Indonesians to grow its transit traffic. Singapore-based low-cost carriers are also carrying an increasing number of transit passengers from Indonesia to destinations throughout the Asia-Pacific region. Indonesia is already the largest market for Changi, driven by strong transit and equally strong local traffic. There are currently about 235,000 return seats between Singapore and Indonesia. This will increase to over 255,000 seats by the end of 2013, according to CAPA calculations. As a result Indonesia will soon be over 100,000 seats bigger than the second biggest destination from Changi, Malaysia. Indonesia will also be about double the size of Changi’s other main destinations, Australia, China and Thailand. The gap between Indonesia and Changi’s other markets will continue to increase as additional capacity continues to pour into Singapore-Indonesia routes – including Jakarta (Changi’s largest single destination), the resort island of Bali (Changi’s sixth largest destination based on capacity) and secondary destinations. Note: Figure for Indonesia is slightly under-represented due mainly to exclusion of Turkish Airlines, which operates Istanbul-Singapore-Jakarta with pick-up rights in Singapore. Actual figure is about 235,000. Changi has seen passenger traffic growth slow to about 5% through the first seven months of 2013. Indonesia should help drive faster growth for the remainder of 2013 and 2014, although Changi’s numbers may not quite return to double-digits due to the continued weakness in the long-haul market. Changi recorded three consecutive years of double digit annual traffic growth in 2009 to 2012 before seeing the slowdown in 1H2013. Indonesia will account for over 17% total capacity at Changi in late 2013 compared to about 13% one year ago. The 40% capacity growth in the Indonesian market should drive by itself overall passenger growth at Changi of about 5 ppts. The over 255,000 weekly return seats in the Singapore-Indonesia market for late 2013 represents approximately 40% growth compared to the 182,000 weekly return seats from late 2012. Five of the six main players in the market have expanded – SIA, Tigerair, Garuda, AirAsia and Jetstar. Only Lion Air, which has kept its capacity flat at about 21,000 return seats, has not expanded. The SIA Group, which includes SilkAir, has expanded by 30% year-over-year from about 30,400 one-way weekly seats in late Nov-2012 to about 39,500 seats in late Nov-2013. But as the overall market has expanded even faster, SIA will see its share of capacity slip 2ppt from 33% to 31%. SIA has added capacity in all four main Indonesia markets – Jakarta, Bali, Surabaya and Medan. It also has added three new smaller markets, with SilkAir launching service to Semarang at the end of Jul-2013, to Makassar at the beginning of Aug-2013 and recently announcing Yogyakarta, which will begin on 25-Nov-2013. Tigerair has been growing the fastest in the Singapore-Indonesia market, more than quadrupling capacity from only 3,780 one-way weekly seats in Nov-2012 to 15,840 in Nov-2013. The LCC group will account for 15% of capacity between Singapore and Indonesia in Nov-2013, up 11ppts from 4% in Nov-2012. This includes flights operated by Tigerair Singapore and sister carrier Tigerair Mandala. Tigerair Mandala, which launched operations in Apr-2012, has driven much of the growth in the Singapore-Indonesia market. Medan-Singapore was launched in Apr-2012, just a few weeks after the carrier’s domestic launch. Bali-Singapore was added in late 2012 while services to Singapore from Surabaya, Jakarta and Pekanbaru were added in 1H2013. Sister carrier Tigerair Singapore has grown significantly in Indonesia in 2H2013, launching Yogyakarta in Jul-2013 and Bandung in Aug-2013 and recently announcing the addition of Lombok from Oct-2013. Tigerair Singapore also began operating alongside Mandala on Singapore-Bali in Jul-2013 and will start operating alongside Mandala on Singapore-Surabaya in Nov-2013. Previously Tigerair Singapore only served one Indonesian route, Jakarta, which it also has increased from two to three daily flights while Mandala has quickly added three more flights for a total of four. Indonesia AirAsia remains the largest LCC in the Singapore-Indonesia market but has seen its market share slip over the last year and is close to be overtaken by Tigerair. AirAsia will have 21,960 weekly one-way seats in the market in Nov-2013, representing a year-over-year increase of 34%. But as this does not quite match the 40% overall increase in the market its share slips from 18% to 17%. Indonesia AirAsia has launched four new routes to Singapore over the last year, giving it eight – which matches the current figure from rival Tigerair. But the new routes have been launched with relatively low frequency while it has not yet followed other carriers in adding capacity on the bigger routes of Singapore to Jakarta and Bali, which it continues to serve with six daily and four daily frequencies respectively. Indonesia AirAsia in Aug-2013 launched services to Singapore from Medan and Surabaya with two daily and one daily frequency respectively. The carrier had been trying to launch both these routes for over one year but had been stymied by Singaporean authorities. Although technically it already had the traffic rights for these routes before the new bilateral was forged in early 2013, the new air service agreement led to a warmer reception in Singapore for Indonesian carriers, paving the way for Indonesia AirAsia to finally launch the two routes. Indonesia AirAsia also launched service from Singapore to Semarang in Feb-2013 and to Makassar in Jul-2013. These routes are currently served with six and four weekly frequencies respectively. For now AirAsia is the only LCC in these markets although it may not enjoy this distinction for long given Tigerair’s rapid expansion. AirAsia enjoyed being the only LCC on Singapore to Bandung and Yogyakarta until Tigerair entered both these markets in Jul/Aug-2013. Jetstar was the first LCC in the Singapore-Indonesia market but for several years did not pursue any expansion as Indonesia AirAsia, Lion and more recently Tigerair grew rapidly. Jetstar is finally increasing capacity in Oct-2013 on three of its four Singapore-Indonesia routes but the capacity increases are relatively modest. Jetstar will offer 9,540 weekly one-way seats in the Singapore-Indonesia market in Nov-2013, up 26% from Nov-2012. Its share of the market has dropped from 8% in Nov-2012 to 7% in Nov-2013. Jetstar Asia subsidiary Valuair operates most of the group’s Singapore-Indonesia flighs. 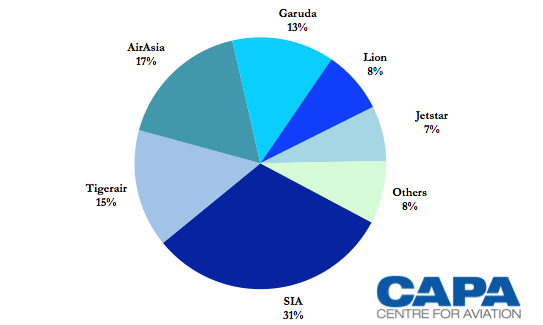 Lion’s decision not to take advantage of the new bilateral and add capacity to Singapore has resulted in the carrier’s market share slipping from 12% in Nov-2012 to 8% in Nov-2013. Overall, however, LCCs have expanded faster than full-service carriers. 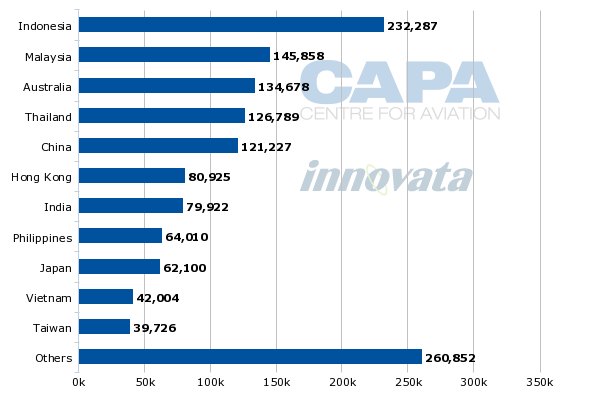 Total LCC capacity in the Singapore-Indonesia market is up 61% year-over-year to about 61,600 weekly one-way seats. The LCC penetration rate in the Singapore-Indonesia market will reach 48% in Nov-2013, compared to 42% in Nov-2012. Indonesian flag carrier Garuda has been the fastest-growing full-service carrier in the market. Garuda will offer about 33,300 return seats in Singapore in late Nov-2013, representing a 59% increase over the same period in 2012. Garuda has added capacity in two of its three existing routes from Singapore, Jakarta and Bali, and also launched Surabaya service in Jul-2013. 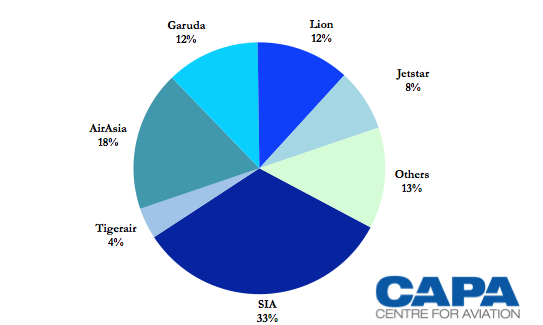 Garuda will account for 13% of capacity in the Singapore-Indonesia market in Nov-2013, up 1ppt from 12% in Nov-2012. Garuda, however, has not yet penetrated secondary Singapore-Indonesia routes. Besides serving the three largest Singapore-Indonesia routes, Garuda only currently links Singapore with Balikpapan. Garuda launched four weekly flights on the Singapore-Balikpapan-Makassar route in Jul-2012. So far SilkAir and LCCs have driven the growth seen on Singapore-Indonesia secondary routes. The 3Q2013 launch of Tigerair service to Bandung and Yogyakarta has driven year-over-year capacity increases of 43% and 153% respectively. SilkAir is also launching Yogyakarta in Nov-2013 and launched Bandung back in Oct-2011. Bandung and Yogyakarta are both popular cultural destinations on the island of Java, where Indonesia’s two largest cities of Jakarta and Surabaya are also located. Bandung is currently the fifth largest Singapore-Indonesia route after Jakarta, Bali, Surabaya and Medan with about 4,600 weekly one-way seats. Yogyakarta is the sixth largest Singapore-Indonesia route and will have about 3,200 weekly one-way seats after SilkAir launches service in late Nov-2013. Of the 14 Singapore-Indonesia routes, only Balikpapan (served by Garuda and SilkAir) has seen a capacity decrease over the last year. In addition to Yogyakarta, Pekanbaru and Lombok have seen increases of over 100% while Makassar has become a new non-stop destination from Singapore. The launch of four weekly flights by Tigerair Mandala has driven the increase in Pekanbaru, which was previously only served by SilkAir with four weekly flights. Tigerair Singapore is also driving the increase at Lombok, which it will start serving in late Oct-2013 with three weekly flights. SilkAir, the only carrier currently on the Singapore-Lombok route, also has added two frequencies in the market over the last year. The Singapore-Makassar route was not served at all until Jul-2013, when Indonesia AirAsia launched four weekly flights followed quickly by SilkAir with three weekly flights that began at the beginning of Aug-2013. Capacity has also nearly doubled on Singapore-Surabaya and Singapore-Medan. While there was still space in the bilateral for more capacity on these routes before the 50% increase was agreed in early 2013, the sudden surge in recent months could lead to both routes hitting the new caps. Surabaya-Singapore will have over 12,500 one-way weekly seats in Nov-2013, up 87% compared to Nov-2012. Tigerair, SIA, AirAsia and Garuda have been the biggest drivers as all four carriers have launched services on the route. Tigerair Mandala launched a daily flight on the route in early 2013 and Tigerair Singapore recently unveiled plans to also serve the route with six weekly flights starting on 15-Nov-2013. The Tigerair Group has quickly grown to capture a 19% share of capacity in the market. AirAsia launched a daily service on the route in Aug-2013 and has captured a 10% share of the market. SIA entered the market in Jul-2013, taking over one of the two frequencies from SilkAir. But the resulting capacity increase has not been enough to maintain the SIA Group's market share, which has dropped from 29% to 23%. Garuda entered in Jul-2013, initially with four weekly flights and plans to upgrade the service to daily in Nov-2013. It will have a 9% share of capacity in the market once the daily flight is introduced. Singapore Airlines includes SilkAir. In Jul-2013, SIA mainline took over from SilkAir 7 of the 14 frequencies on the route. Singapore-Medan will have about 8,500 weekly one-way seats in Nov-2013, up 95%, compared to Nov-2012. The increase in capacity has come as a new airport opened in Jul-2013 outside Medan, replacing a cramped downtown airport. The increase in capacity has been driven by the Aug-2013 launch of two daily flights on the Singapore-Medan route by Indonesia AirAsia, which has quickly captured a 30% share of the market. SilkAir is also now in the process of introducing a third daily frequency while Jetstar has unveiled plans to add four weekly frequencies from late Oct-2013 for a total of 10. But SilkAir/SIA has seen its share drop from 46% to 34% and Jetstar has seen its share drop from 25% to 21%. In this case Tigerair has not accounted for any of the capacity increase as Tigerair Mandala launched Singapore-Medan more than one year ago, in Apr-2012. The Singapore-Bali market has not seen the same kind of increase as Surabaya or Medan but has grown as fast as the overall Singapore-Indonesia market, recording 40% year-over-year capacity growth to about 25,700 one-way seats. Bali is a different market than Surabaya, Medan or Jakarta as it is mainly an inbound tourism destination. The growth at Bali has been driven by the introduction of a fourth daily flight from SIA and the launch of service from Tigerair, which is now serving the market with two daily Tigerair Mandala frequencies and five weekly Tigerair Singapore frequencies. The Tigerair Group will capture a 13% share of capacity in the market in Nov-2013 while SIA will have a leading 32% share. Garuda in Jul-2013 also increased Singapore-Bali from seven to 11 weekly flights and is scheduled to add another three weekly frequencies in Nov-2013, resulting in a double daily service. This will give it an 8% share of the market. Jetstar is adding five weekly flights in Oct-2013 but has still seen its share of the market slip slightly from 9% to 8%. Indonesia AirAsia has seen a stiffer drop in capacity share, from 27% to 20%, as it has not added any capacity on Singapore-Bali over the last year. Singapore-Bali is also served by KLM ad Qatar Airways, both of which have pick up rights as part of daily flights which originate in Amsterdam and Doha. The 40% increase across the Singapore-Indonesia market could prove to be overly ambitious, particularly on some routes where capacity has grown at a faster clip than the overall average. But over time the capacity should be sufficiently absorbed. Local demand for Singapore-Indonesia services remains high. But just as importantly demand throughout Indonesia for Changi as a transit hub is growing. Congestion at Jakarta will likely get even worse over the next several years as Indonesian authorities are slow to move on airport expansion and replacement projects. This will benefit Changi and the carriers that serve the Singapore-Indonesia market, driving further growth. LCCs will continue to grow faster than full-service carriers, leading to a penetration rate which will soon pass 50% and could ultimately approach 60%. But as the SIA, SilkAir and Garuda expansions illustrate, there is still opportunity for full-service growth in this short-haul market. Indonesia will continue to be an important driver for growth for Changi, the SIA Group and all Singapore-based LCCs.